One of the grandest green spaces in Paris, the Champ de Mars stretches northwest to southwest from the foot of the Eiffel Tower to the Ecole Militaire. A symbol of military prowess and discipline, you can easily imagine soldiers parading down its long, wide "avenues," which are punctuated by an oblong plot of green at the center. From the top of the French capital's most-famous tower it can be observed in its full grandeur. No wonder it made our list of the most interesting places to visit in the area. Read on for tips on how to enjoy this stately park and its surrounding attractions. Appropriately named after the Roman god of war, the Champ de Mars was once an agricultural site: a fact that helps explain why it appears so flat when viewed from panoramic heights. Fittingly, "champ" means "field" in French. Ordinary Parisian citizens farmed small plots of land in the area, then known as the Grenelle, growing fruit and vegetables and selling them at onsite markets. Vineyards were also planted in the area when Paris was still a winemaking site. This all changed around 1765, when planning began in the area for a prestigious military academy known as the Ecole Militaire. A new green space, featuring the precise sorts of symmetries popularized in formal French gardens at Versailles, the Tuileries and elsewhere, replaced the farm plots of old. The world's first hot-air balloon was launched from the park in 1783 — an exciting moment in the early history of aviation. Following the French Revolution of 1789, both festive and bloody events and took place on the Champ de Mars between 1790 to 1791. The first celebration of the holiday that would eventually be termed "Bastille Day" took place here, a year to the day after the storming of the prison on the Place de la Bastille. In 1791, a brutal massacre was perpetrated at the site. A guillotine was set up by the Revolutionary government on the Champ; the first mayor of Paris was executed here in 1793. The site also appears in many commemorative illustrations and other memorabilia marking the unveiling of Gustave Eiffel's bold new tower, during the Universal Exposition of 1889. As one of the most-recognizable sites in the French capital, the park is incredibly popular with tourists. Here's how to best enjoy it, no matter the season. A stroll down the long, wide green expanse and gardens within can be pleasant year-round, except perhaps when the weather is at its coldest and wettest. Still, rain or shine, many tourists enjoy the excellent views of the Eiffel Tower from the Champ de Mars, and take advantage of the photo opportunities during a walk around the gardens. In the spring and summer, sprawl out for a picnic on the lush lawns. We recommend that you stock up on typical French picnic goodies such as fresh, crusty baguettes, pastries, fresh fruit and charcuterie (cured meats) on nearby streets such as Rue Cler, famous for its shops and excellent bakeries. If you're short on time, you can also buy a sandwich, crepe or other Parisian street foods from shops in the area and enjoy a casual outdoor meal on the grass after visiting the Eiffel Tower or the nearby area known as "Trocadero." As you can imagine, this area can be very crowded due to the large numbers of visitors who flock to see the Eiffel Tower. It may be best to visit in the early mornings and on weekdays to beat the crowds and enjoy the "Champ" in relative peace and quiet. It's obviously less crowded during the late fall and winter since low season means fewer tourists — but chilly winds and rain can make it less appealing to linger outdoors during these times. 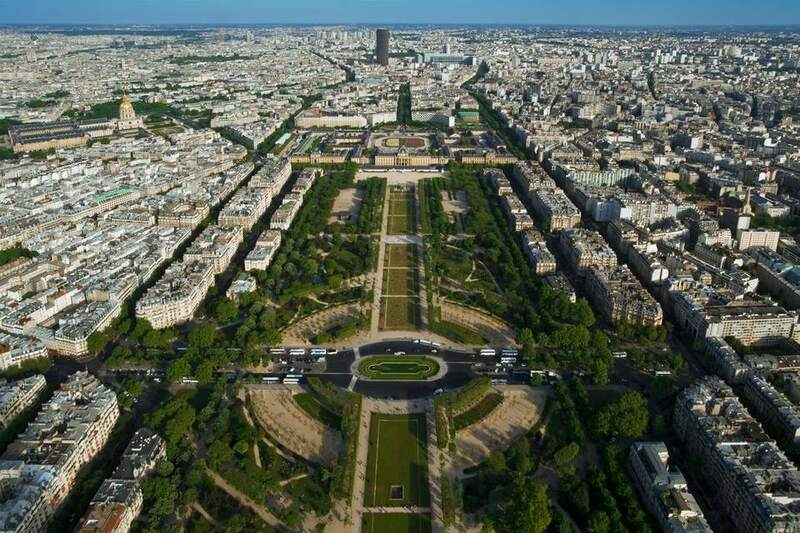 The Champ de Mars is located in the 7th arrondissement of Paris, on the left bank of the Seine River. It is easily reached by metro or RER (commuter-line) train. The closest stop is Champ de Mars-Tour Eiffel (RER Line C). If you're taking the metro (most tourists find it more convenient than the RER), the nearest stations are Ecole Militaire (Line 8) or La Motte Picquet-Grenelle (Line 6, 8 and 10). You can also get off at La Tour Maubourg near Les Invalides (line 9) and walk to the park from there. What to See Around the Champ de Mars? There's plenty to see and do around the park. Here are just a few sights and attractions we recommend you focus your time on. Eiffel Tower: This one's an obvious but essential choice. Take the elevators to the uppermost observation decks, and gaze out at the Champ de Mars for some dizzying and grand panoramic views. Photo ops are excellent from up here, of course. You might also want to eat lunch or dinner at one of the tower's restaurants, to enjoy the views for even longer. Palais de Chaillot and the Trocadero: After visiting the city's most-celebrated tower, head over to the nearby Palais de Chaillot, unveiled for the Universal Exposition of 1937. The sprawling plaza here affords more excellent views of Gustav's beloved tower, and several sites of note occupy the buildings. The Cité de l'Architecture houses an interesting collection devoted to architectural history, while the Musée de l'Homme is dedicated to anthropology. There's also a national theatre where dance performances are regularly held. Palais de Tokyo and the Modern Art Museum of Paris: Modern art fans should spend some time perusing the innovative exhibits at the nearby Palais de Tokyo and Modern Art Museum of the City of Paris. These are two of the most important contemporary art museums in the French capital, and are well worth a look. Galliera Fashion Museum: For something a bit off the beaten path, why not stop over at the nearby Palais Galliera? The fascinating museum of fashion here puts on exhibits dedicated to style icons and designers that regularly sell out. On a sunny day, the garden out front, decorated with lush flower beds and elegant sculptures, is a lovely place to take a rest after a day of exploring the area. Please note: This museum is currently closed for renovations and is expected to re-open at the end of 2019. Invalides and the Musée de l'Armée: Head over to the sprawling military complex known as Les Invalides to witness the tomb of Emperor Napoleon I, and see the collections of the adjoining Army Museum (Musée de l'Armée). From medieval armor and impressive swords to more modern artillery, including the Emperor's personal firearms, there's a wealth of objects to admire at this underrated museum.